I previously had the opportunity to review the SIG P229R. I was so pleased with the firearm, that I was immediately in the market for a SIG. I new that which ever Sig I bought, I would really like to shoot it, and often. 9mm made the most sense because the ammunition pretty affordable, and I am completely confident in 9mm as a defensive caliber. It also must be light, durable and easy to carry while camping or dirt bike riding. With the success of Glock and other polymers making their way into the hands of officers and civilians alike, I opted to finally purchase the Sig Sauer version of the polymer pistol. What I ended up with was the Sig Sauer P2022. This polymer frame gun with a stainless steel slide is very similar to the P229, but for about half the price. The grip and controls are very similar as is the 3.9" barrel length and overall size. 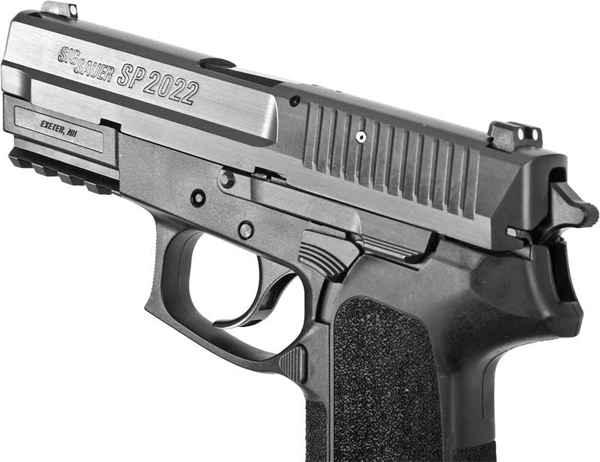 The SP2022 is also available in 40SW and 357 SIG. The grip was very similar to the SIG P229, and that is a plus for me. I opted for the medium grip, as there are 3 different sizes which we ordered separately. The slide on this firearm verified it was, like the P229, made in Exeter. The decocking lever on this gun did feel a bit different than the one on the P229. Perhaps it was the "brand new, not broken in yet" feeling. However I had no doubts it would function as it was supposed to. It seemed a bit strange at first, but it did perform correctly. The finish and quality seemed up to par with anything other firearm the Sig Sauer lineup. It was not an HK by any means, but was built with care. The gun features a locked breach, polymer frame, de-cocking lever, 1913 accessory rail, SIG's night sights and a 10lb. double action first pull followed by 4.2lb single action trigger pull. This SP2022 came in a plastic case with two 10 round drop-free mags, gun lock, and SIG lube. 15 round mags are also available, outside Cali that is. Field strip and cleaning are pretty straight forward. If you have ever field stripped a 1911, you will have no problem at all. It is quite similar, except there is no front bushing to turn at the muzzle. Simply line up the notches on the slide with the slide catch pin and push the pin out. Now the slide is free from the frame and can be slid forward and removed. Next as with other semi-autos you can remove the spring and barrel. The assembly however might take a bit of getting used to. You must position the slide and run it back until the hole for the pin lines up with the slot in the barrel. If you go to far the pin will not slide in place. Once lined up, partially push in the pin. Now run the slide all the way back until the second notches line up and then pop the pin in entirely. Again this is no big deal for a 1911 user, but if you are more familiar with a Glock field strip, this may be weird at first. Here is where the the true test begins. Up until now everything was superficial. The double action pull was a bit tight at first, but loosened up after time. (This gun will only be in DA mode if you manually decock it for carry.) Single action mode was amazing. It was one of the nicest triggers I have felt. It was crisp and broke clean every time. I actually liked the trigger on this gun better than the SIG P229. Another apparent difference was the frame. Strange thing about polymer is that it actually reduces vibration. It is lighter yet also helps to absorb the recoil. It was so smooth in fact, I have no doubt that even a 12 year old child could shoot it accurately. Like the SIG P229 this gun seemed like an old friend. The sights on this pistol are already set up to my preference. A "combat" sight picture. This is where the front sight completely covers the bulls eye of the target. Finding targets was easy. It connected wherever I pointed it. 10 yards, 15 or 25, it didn't matter, it was accomplished effortlessly. We fired several different rounds through the gun to test for reliability. We started with Federal ball ammo, switched to hydroshock hollow points, then some Speer Gold Dots. Every round went off perfectly without exception. We then fed some Cor-Bon +p rounds and yet again it fired flawless. There was actually very little difference in recoil at all when shooting the +p. Because this was my personal and newly purchased firearm, I did not subject it to the same abuse we did with the SIG P229. However one of our shooters (who shall remain anonymous) managed to accidentally drop it in the sand and kick it. We simply dropped the mag, removed the slide and rinsed it out with the nearby hose. It splatered a bit on the first few shots, but again performed without a hiccup. Not a big deal I suppose. I am impressed for sure. I think the SP2022 is a hidden gem, and is completely underrated. The gun does exactly what it was meant to do. It is well built and extremely user friendly as all the controls are right where God intended. The Sig SP2022 easily digested all the ammunition we fed it and was quite accurate with all of it. It is light, easy to carry, reliable and a top performer. All in all I have no complaints and I am very satisfied with my purchase. If you are in the market for a Glock, and want Glock reliability but prefer a DA/SA platform, the SP2022 is definitely one to look at. The trigger is better, the sights are better, and it is effortlessly accurate. I am actually curious to see how well I can shoot it blindfolded. The guys at the range seemed to think that was a bad idea, so I will leave it at this... it simply works for me. 29 oz. 29 oz. 29 oz. what are your thoughts on the sp2022?